Today, we announced the general availability of R Server for Azure HDInsight. This gives Azure HDInsight the most comprehensive set of ML algorithms and statistical functions in the cloud that also leverages Hadoop and Spark. What is R Server on HDInsight? R is one of the most popular programming language that helps millions of data scientists solve their most challenging problems in fields ranging from computational biology to quantitative marketing. R Server for Azure HDInsight is a scale-out implementation of R integrated with Spark clusters created from HDInsight. This gives you the familiarity of the R language for machine learning while leveraging the scalability and reliability built into Spark. Multi-threaded math libraries and transparent parallelization in R Server handle up to 1000x more data and up to 50x faster speeds than open source R, helping you train more accurate models for better predictions than previously possible. A top choice among data scientists, the R programming language has a thriving global community of more than two million users worldwide, and the total number of open-source analytics packages is growing exponentially year over year. 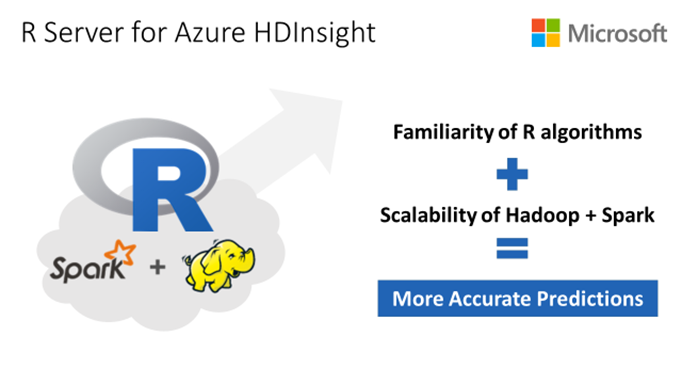 With R Server for HDInsight, you get full compatibility with the R language running at scale on Hadoop and Spark. New in GA, we include the ability to use Spark SQL as a data source for R Server. Load the results of a Spark SQL query against sources such as Apache Hive and Parquet to a Spark Data Frame, and analyze it directly using any R Server distributed computing algorithms. New in GA, we include R Studio Server Community Edition making it easy for data scientists to get started quickly. You can also download R Tools for Visual Studio free for a convenient local development environment. To get started, customers will need to have an Azure subscription or a free trial to Azure. With this in hand, you should be able to get a R Server cluster up and running in minutes by going through this getting started guide. Also, head over to watch this Channel 9 video below.